Hi, I'm Julius Guevarra. I am a passionate, friendly, creative, detail-oriented Web and graphic designer. I create beautiful and professional designs and web interfaces using best practices that will make them exceptional and create a meaningful impact. I just graduated this month with a degree of Bachelor of Science in Information Technology. It would be definitely hard for me to seek for a job knowing that a lot of competitors with the same level of my skills will be getting on my way to get the first job. Probably my best solution was to create a personal identity that truly speaks to my personality and my work. Something that will make an absolute impression on potential employers and display my skills of creating complex and awesome designs. My first process begins with traditional sketching. With a pen and paper, I sketch out designs that comes to my mind. Every single stroke, new ideas comes. But I don’t just sketch, I consider many things and ideas to convert it into visual language. One of them is my personality? How can I convert it into a visual language? These ar some of the things that I consider during the process. With the sketches done, I converted them into a vector. I make it as quick as possible. After it is done, I post this designs in social media to which graphic design related groups I am in. I ask for their critiques and comments about my designs. I let them choose which design they like from a designer’s perspective. these following designs caught their attentions. I then made further studies to choose which one stands out from the rest. 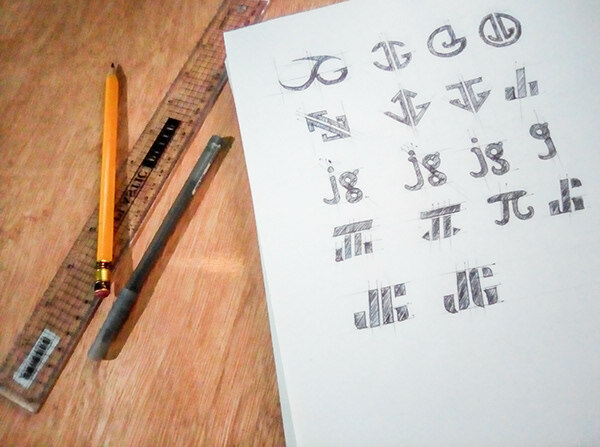 After a tiring days of the process, it's now time to the construction and refinement of the logo. In this step, I made the changes that will make the chosen logo even better as suggested by fellow designers. The logo's look in different background color. With a lot of basic elements completed, I designed necessarry stationary once I began to apply for jobs and to network. This included business cards and a resume/cv. Here is my personal website that I designed and coded from scratch.